TMNT Entity: Terror by Transmat! Within a hovercraft flying above a city on the Utrom Homeworld, Professor Honeycutt thanks Donatello and the other Turtles for accepting their invitation to the planet. Don remarks that he’s enjoyed the past week with the Utroms and, at any rate, their current visit has been much more relaxing than their last one. Suddenly, the Utrom piloting the craft gets an emergency message from Security Officer Yat, exclaiming that six Utroms are dead and thirteen are wounded at Transport Station Twelve. Tricratons have invaded the facility and are holding it hostage. They land and Yat explains the details. A larger Triceraton invasion force have apparently stumbled upon a transport station on Gavat-4 and the three Triceratons within the transport station on the Utrom Homeworld intend on activating the transmat devices and inviting their invasion force in. Yat asks the Turtles to help, explaining that the Utrom code forbids lethal force, so they’ll have to be equipped with stun weapons. Leo and the Turtles agree to the terms and arm up. Inside the transport station, the Turtles take down the trio of Tricerations with relative ease, but the more difficult task awaits. It would seem that three Utrom hostages are being held at the Gavat-4 station and have each been booby-trapped with explosives. If the Utroms try to beam them out, they will detonate the explosives. Leo quickly concocts a strategy, though it will involve Professor Honeycutt’s help. On Gavat-4, the Triceratons are anxiously awaiting the rest of their troops for the impending invasion. Inside the transport station, the Triceraton Captain Zarg is torturing one of the Utrom hostages, held beneath a net. He wants the manuals and data bases for operation of the transmat, but gets no answers from the Utrom. Suddenly, three Utrom robot bodies appear on the transmat platform, firing weaponry. The Triceratons blast them away as the Turtles materialize quietly behind the machine. Leo remarks that their diversion with the empty robot bodies worked and orders his brothers to get into position while Professor Honeycutt rigs his gear. The Turtles get to a vantage point and snipe all the Triceratons with stun rays. Meanwhile, Leo and Honeycutt free the Utroms. With some effort, Honeycutt manages to deactivate the explosives on the hostages. Don, Mike and Raph finish setting explosive charges of their own across the machinery as a drop ship of thousands of Triceraton warriors arrives. With fifteen seconds to spare, the Turtles, Honeycutt and the hostages make it to the transmat platform and beam out just as their charges detonate the facility, leaving behind thousands of pissed off Triceratons. *This story was republished in “Shell Shock”. 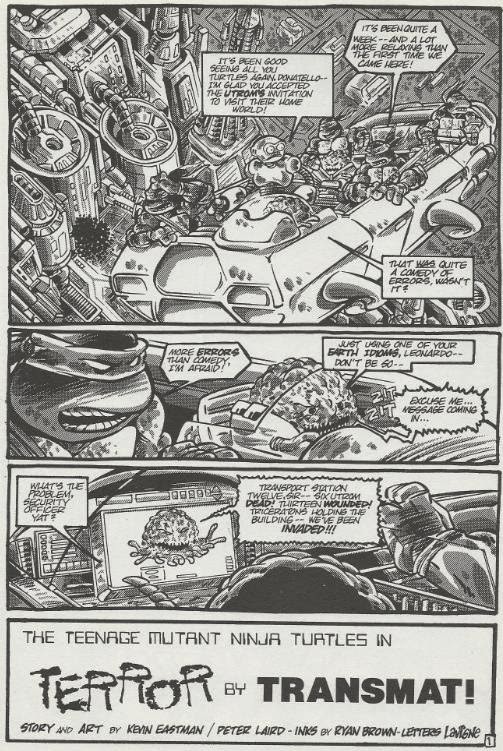 *The Turtles first visited the Utrom Homeworld off-panel in TMNT (Vol. 1) #7. *Security Officer Yat will appear again in TMNT (Vol. 3) #24. *The Turtles will meet the Utroms again in Tales of the TMNT (Vol. 2) #23. *The Fugitoid (incognito) will return in TMNT (Vol. 4) #1. *This is the first comic to use the name "Utrom", as the creatures were previously only referred to as "The T.C.R.I. aliens". The name comes from the Palladium sourcebook the comic was originally published in, "TMNT's Guide to the Universe". Not many people put a lot of stock in these Turtles back-up strips and shorts, mostly interpreting them as comedy relief pieces or meaningless filler. While in some cases they aren’t too far from the truth, that description doesn’t come close to fitting all of them. Case in point: “Terror by Transmat”. This ten page tale acts as something of an epilogue to the entire Triceraton/Utrom arc from early in TMNT (Vol. 1) (or more specifically, issues 4 through 7). That arc ended with the Utroms rather haphazardly dumping the Turtles in April’s bathroom and the Turtles cursing their existence. Here, the overly formal and pacifist Utroms stay true to their nature and invite the quartet of Earthlings who helped them out so much to come chill on their home planet for a week. It goes a long way in developing the cooperative relationship between the Turtles and the Utroms, as well as their friendship with Professor Honeycutt, who we’re going to be seeing quite a bit of down the line when we get to TMNT (Vol. 4) and Tales of the TMNT (Vol. 2). And in addition to all that, we get another look at the ongoing struggle between the Utroms and the Triceratons, letting us see just how dire their conflict is. 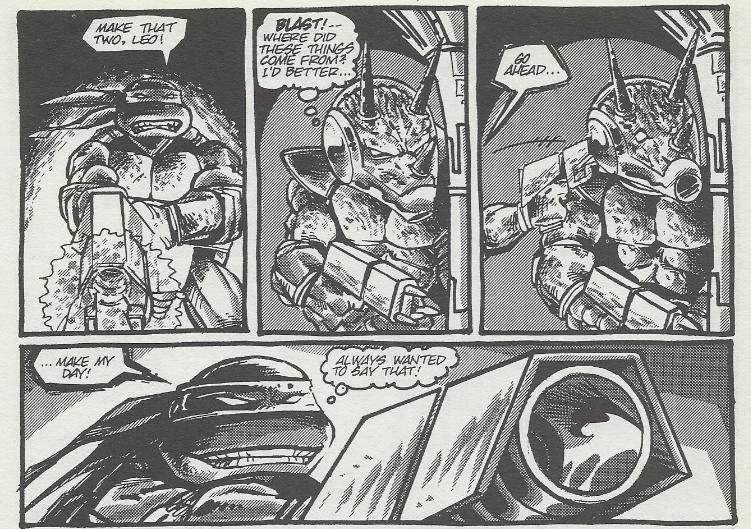 While the story-itself is a bit of a cut and dry action/adventure, it’s what “Terror by Transmat” contributes to the larger scope of the Turtles universe that counts. And, of course, like most of these back-up shorts, we get some vintage art by the Eastman/Laird team. Their style may not be as flashy as some of the later Mirage staffers who’ll work on the title, but it’s always a welcomed sight. People often complain that following the first ten issues of TMNT (Vol. 1), Eastman and Laird sort of began to disappear from the book on an art-level. 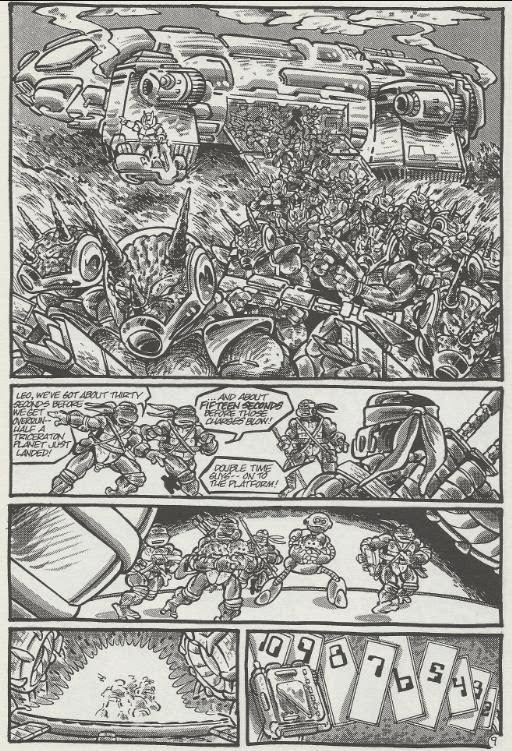 That may be true, but if you need a fix of classic Eastman/Laird Turtles art in a sequential fashion, then dude, just get a shovel-full of these short strips. They did, like, fifty of em. “Terror by Transmat” is another one of those TMNT back-ups I recommend seeking out because it has some genuine substance to it. I own it via the “Shell Shock” printing, as I’ve never had an interest in the role-playing guides in which it was initially published. Either way, if the Utrom/Fugitoid/Triceraton stuff is your favorite aspect of the TMNT, then you’ll be doing yourself a favor by tracking this one down. This is also the first TMNT story I can find which officially names the Utrom species. In the #2-7 arc, Splinter simply referred to them as "the TCRI." Do you know of an earlier appearance of the word "Utrom"? Actually, I think you're right on the money with that. I flipped through #s 2-7 recently and didn't see the word "Utrom" used once. The name may have been created strictly for the Palladium RPG sourcebook this comic was originally published in (though I don't own the thing).